A young friend, whose grandma lives too far away for her to attend Grandparents Day at his school, invited me to be his guest. I had a wonderful morning with my friend Otto. He selected a flower for me to plant in my garden—a marigold. In ancient times, marigolds were associated with dark themes such as cruelty or grief, but they are also seen as symbolizing creativity, passion, and good relationships. That is how I see the marigold Otto chose. Otto and I went on a science scavenger hunt over the grounds of his school, Glenelg Country Day School near Elliott City, MD. We found wiggly things under a log, danced on the dragon’s lair, and located particular trees. We didn’t see vultures or find a bird’s feather, but we found everything else on the list. After half and hour of tramping around the grounds, Otto took me to the library. Librarian Angela Horjus and Otto located The Black Alabaster Box on the bookshelf. That was pretty exciting. Angela wrote a review for the cover of The Red Abalone Shell and invited me to be a featured author at the Glenelg Book Fair, held at the Ellicott City Barnes and Noble last year. It was a real treat to be in her beautiful library. I noticed Poetry for Young People: Emily Dickinson on display—what fun to find your books in a school library! 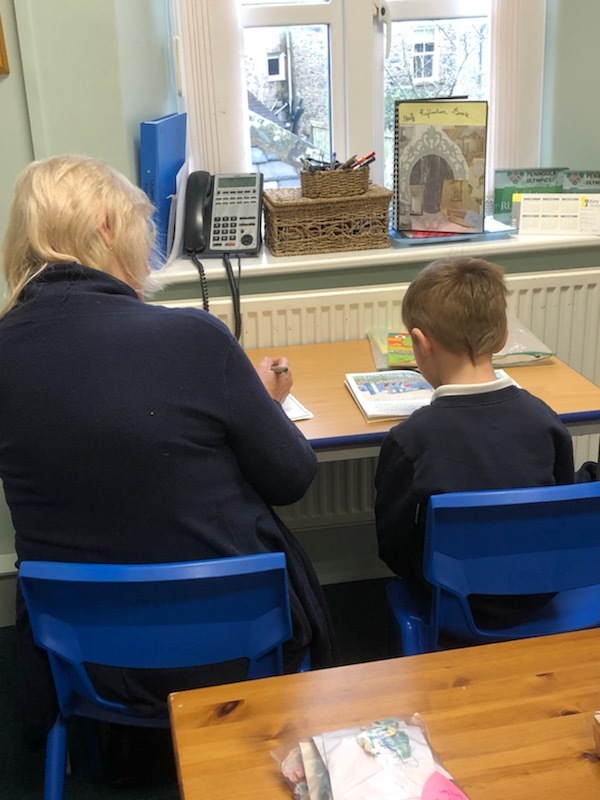 A few weeks ago I visited Cartmel Church of England Primary School in Cumbria. Headteacher Rachel Battersby welcomed me and gave me a tour of the school. 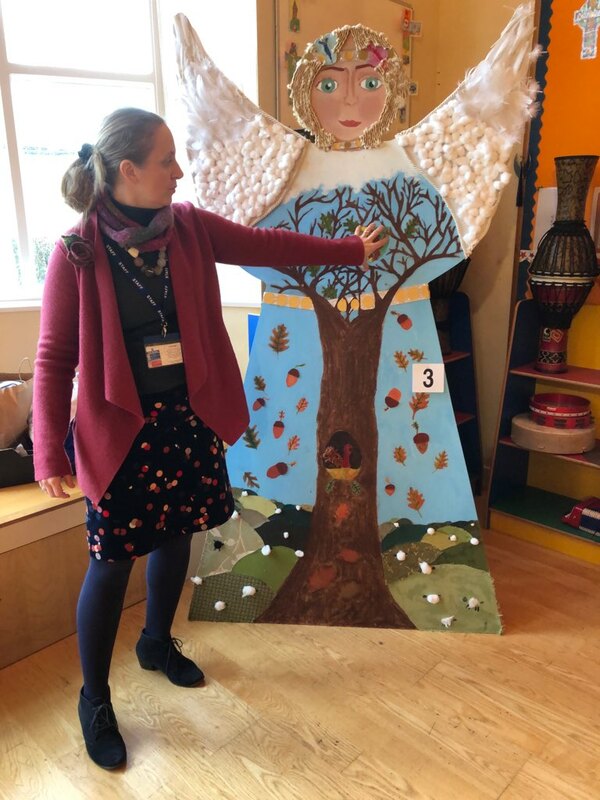 Below she shows me an angel created by the children for a community event. It embodies the school motto: “Mighty Oaks from Little Acorns Grow.” It also illustrates Ms. Battersby’s enthusiasm for the arts. Her background and continuing interest in theatre have helped her to build many bridges to the community and enriched the school program. Cartmel is an historic village. The Cartmel Priory was founded in 1189 by William Marshal, the First Earl of Pembroke. He was a loyal supporter of King John and probably the only one who could have brought the King to Runnymede in 1215 where the Magna Carta was signed. But for many people, Cartmel is famous for Sticky Toffee Pudding—if you don’t know about Sticky Toffee Pudding all I can say is that it is something delicious that you have to experience! I had a wonderful time as guest of Ms. Cheryl Yarrow and Class Three. The girls and boys had a set of questions for me—good questions. I’ll be posting them on my “About” page. I had a chance to read a couple of chapters of The Black Alabaster Box to the class. Afterward, I left a copy of the book for the school library. 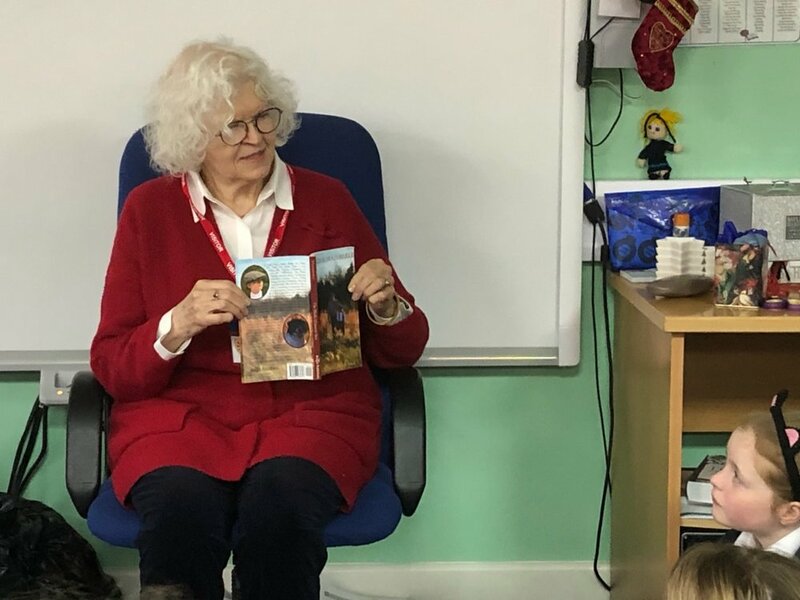 Ms. Yarrow promised the children that they could finish the book together, although I understand that she made no promises about getting Ruby and Junior’s accents right! I’m eager to hear how they got on with it. Book Launch for "The Red Abalone Shell"
Join us on Friday, November 16th for the launch of “The Red Abalone Shell”. There will be a reading from the book, an interview with the author, discussion with a school librarian, and drawings for prizes! THE RED ABALONE SHELL is scheduled for release in early September. 1. The second installment of The Last Crystal Trilogy is even more engaging than the first as Grace’s son, James, sets out on a journey full of danger, discovery, memory, and maturity. Schoonmaker skillfully and meticulously weaves even more history into this story, as we watch World War I unfold and witness how individual liberties can be so easily and tragically curtailed in the name of narrow-minded nationalism masquerading as patriotism. An important message for today perhaps. Once again, the fantasy and magic driving this tale are the glue that keeps it enchanting and mysterious, but this volume adds more historical depth to the brew. Thankfully, Schoonmaker has also captured the danger of the Old West in wonderfully tense scenes without dragging the reader through violent, gore-ridden shoot-outs. There is also a delightful humor to this story in moments that are well-placed to move the plot and balance the emotion. I so look forward to seeing how this story continues in the final volume. 2. The Red Abalone Shellis one of those books that will keep you up late reading to find out what happens next. It is easy to get caught up in this engaging story that follows James after he is found on church steps with his beloved and loyal dog Old Shep. While James loves his adoptive parents, a pacifist German-American couple, he is eager to know more about where he comes from beyond his fragments of memories. The adventure that follows is filled with memorable characters and vivid settings. Woven throughout the story are fascinating historical details about life in the United States on the brink of entering World War I, which will intrigue anyone interested knowing more about this time period. I look forward to sharing The Red Abalone Shell with my students. I know that they will also be quickly caught up in James’ adventure and not be able to put it down. 3. The Red Abalone Shell is the perfect story for any middle grade reader who loves fantasy, mystery, historical fiction, and adventure all in one book. This second book in The Last Crystal Trilogy is the perfect companion to the first book, The Black Alabaster Box, or as a stand alone novel. The book is set during the early 20th century American life. Historical accuracy is obviously paramount to Schoonmaker and lessons on inclusivity and bullying are seamlessly woven in to create a story with rich detail and life lessons. Children won’t even realize how much history they are learning while reading this epic tale. That's right today is the day of the book launch. Yesterday I worked on making several dozen gingerbread cookies, which I hope don't entice Ruby and Junior to show up! You'll have to read the book if you didn't get that reference. This morning we working on getting the place set up for this afternoon's event. All the little details to, hopefully, make it a fun event for everyone - children, parents, adults, and all the in betweens. We are planning a book launch in Baltimore! We've got a venue. We've got refreshments. We've got activities for the kids (and adults!). We've got door prizes. We've even got a few copies of the book on hand for sale. We're just about ready. Are you? We hope you can joins us! "I had never seen my son read a book so fast or get so moved by a story. Just read it yesterday and didn't want it to end. What a gift of genius it is! Beautifully written. Looking forward to the other two books in the trilogy already. I highly recommend it to anyone with kids or to any adult looking for a really good and mysterious adventure in magic and historical fiction." Sarah D.
Barnes & Noble now has the printed versions available on line. You can choose from either a paperback or hardback edition. First Amazon review in. That was a quick read! It's hard to believe the long journey to publication is finally here. I am pleased to announce that The Black Alabaster Box is now available for purchase as an ebook through Barnes & Noble, iBooks, or Amazon. Paperback and Hardcover editions are currently only available through Amazon.